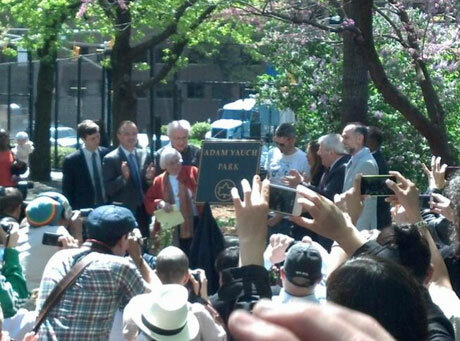 Tomorrow (May 4) marks the one year anniversary of the death of Beastie Boys' Adam Yauch (aka MCA), but the late rapper was toasted today by the City of New York when it redubbed a Brooklyn park Adam Yauch Park. Earlier this morning, an unveiling ceremony took place at Brooklyn Heights' Palmetto Playground, which a press release notes the hip-hop icon had spent time in during his youth. Yauch apparently even learned to ride a bike at Palmetto Playground. Present at the ceremony were Yauch's bandmate Adam Horowitz (aka Ad-Rock), his parents Noel and Frances Yauch, Brooklyn Parks Commissioner Kevin Jeffrey, Brooklyn Borough President Marty Markowitz, State Senator Daniel Squadron, and more. You can see the official placard in the photo up above, which was taken by New York City Councillor Stephen Levin. Shortly after the musician's untimely passing last spring after a bout with cancer, a petition had surfaced calling for the nearby Squibb Park to be renamed after MCA, but locals argued that the move would have been disrespectful to pharmaceutical pioneer Edward Robinson Squibb, who had opened his first lab just down the street in the 19th century. Tomorrow, Brooklyn fans will continue the celebrations at the Littlefield performance and art space, where they'll be holding "MCA Day" festivities. They'll be running an exhibit showing photographs of the late rapper, as well as art from Michael McLeer and more. They'll also be pumping Beastie Boys songs through the speakers throughout the day.